Of an accident I was during this day in Hospital. In 2015 they will organise this special "Dog-Day" again and will invite me! 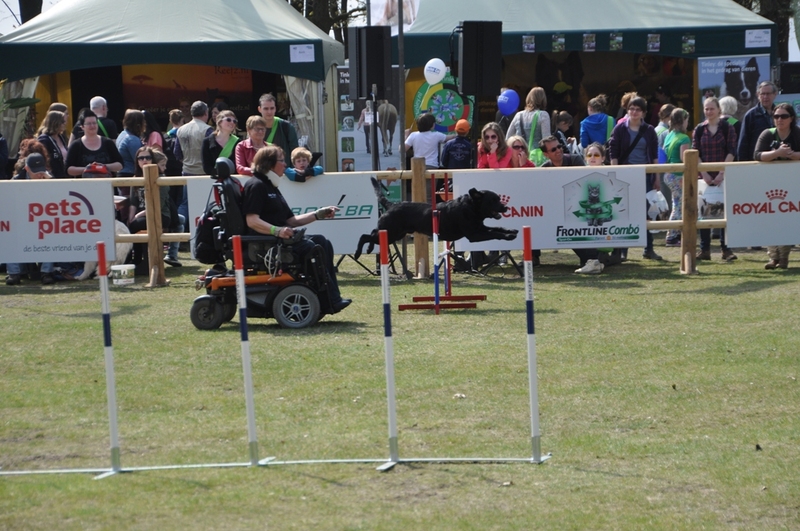 The weather was fantastic, only sun, so all visitors enjoy the more then 100 stands and of course for the dogs a lot of swimming-fun! The hole event was free of entry-fee...even the parking for your car!! 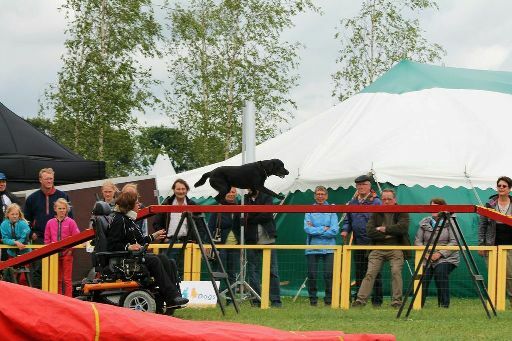 Again Mario Lehtonen, Tonny Wierda and me have deplyed to get more demonstrations and sale- stands with things for dogs in the "Dog Center" on the Country Fair this year in Aalten. We have the feeling it was a great succes! Nice demonstrations from very enthousiast people which had given every demonstation a lot of public round the "Dog Center ". Also our group had given several demonstrations in the big " Central-Ring" of the Country Fair, even here the public was very enthousiast! 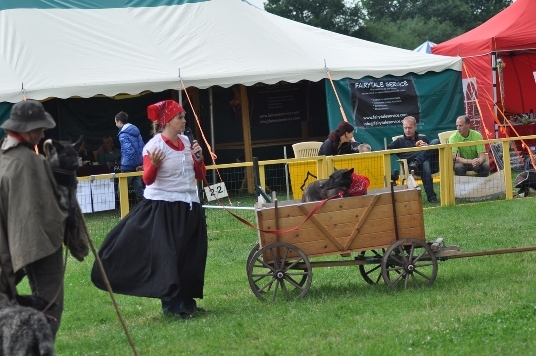 I was with my three dogs Quita, Joep and Joy to take part into the "Parade of Breeds". By a lot of different breeds the public was very interested. All breeds were very clear defined by Tonny Wierda. 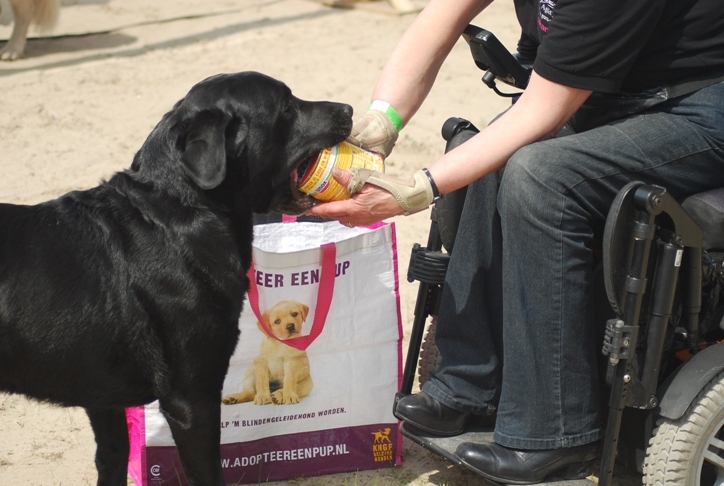 Besides I had given demonstrations servicedogs and para-agility with my dogs Joep and Joy. 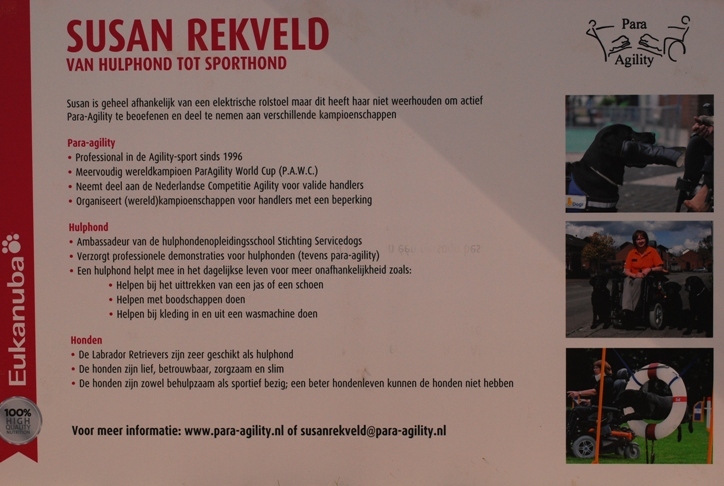 Also we have given, together the group of the demonstrations combi-sport and agility, workshops combi-sport and agility. The public was very enthousiast taking part into different workshops together their dog(s)! On sundaymorning 9th Juni to the field of KC Pampus in Almere. For some weeks ago their hole canteen was burned down...so they had organised a special day to collect some money! 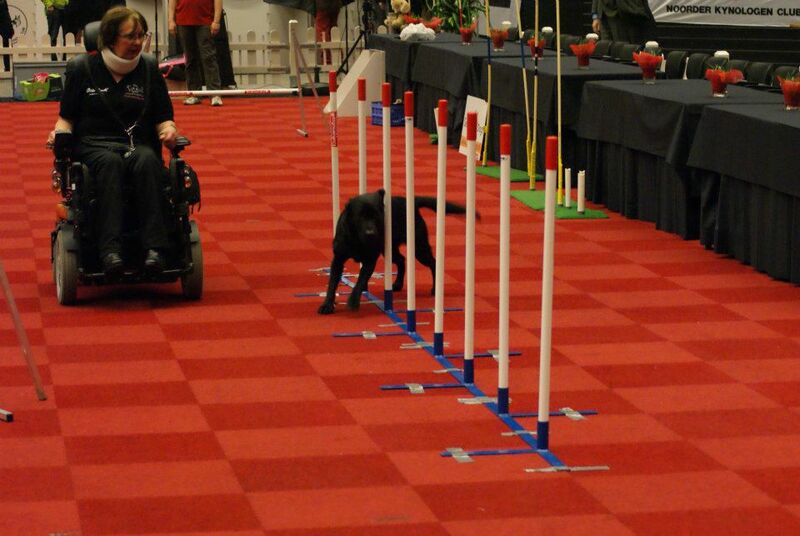 A lot of nice demonstrations, also from trainingschool "DESUDO" (www.stichtingdesudo.nl ), guide dogs for blind people, great to see!! On fridaymorning the 3th we drive to Safaripark Beekse Bergen for give demonstrations for three days on Animal Event, a wonderfull Event with more then 30.000 visitors! 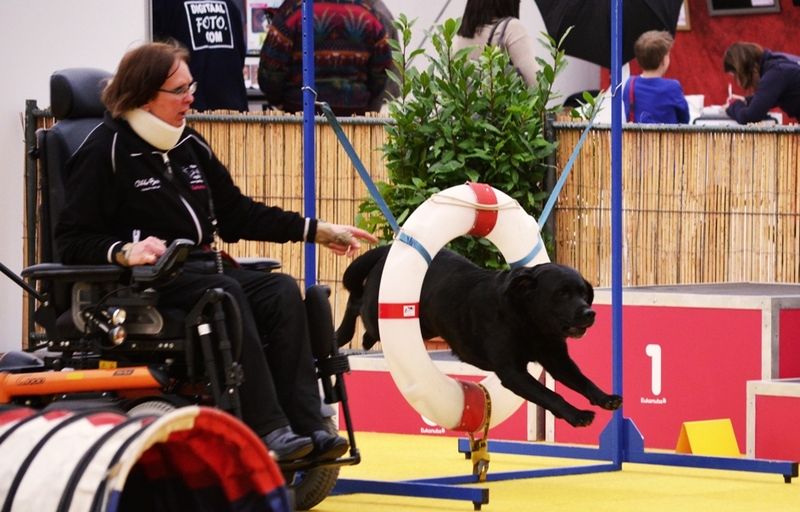 Demonstrations servicedogs in the "dog-ring" beside the big stand of Eukanuba. The demonstrations para-agility in another ring, together the demonstration agility by Lianne v.d. Velde ( www.ofnaniseyes.nl ). 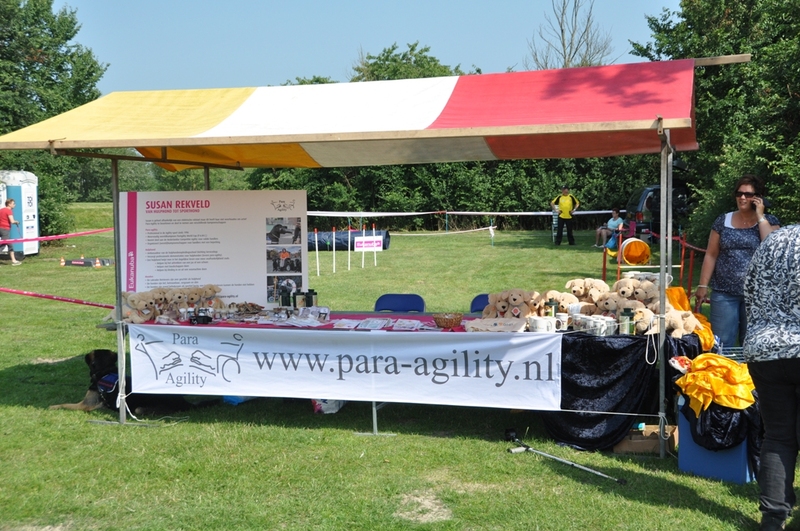 On sunday there was organised a big agility-match by Agility Fanatics ( www.agilityfanatics.com ). 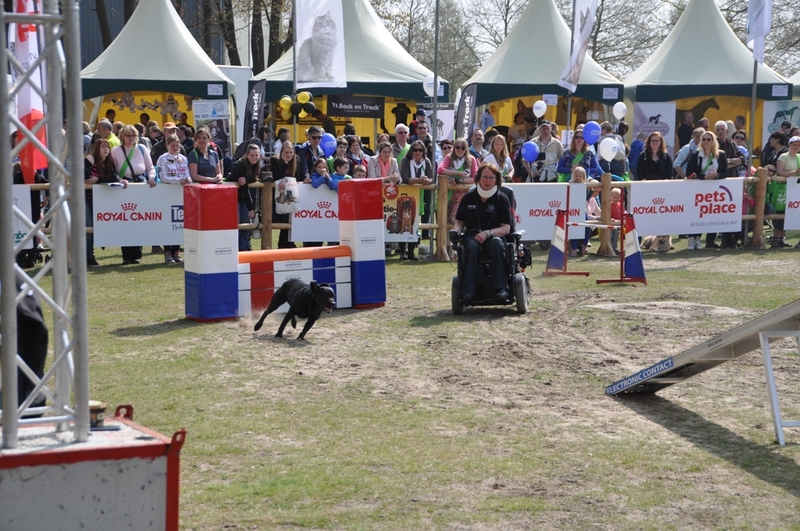 I have run with Joy and Joep some nice courses to show the para-agility! 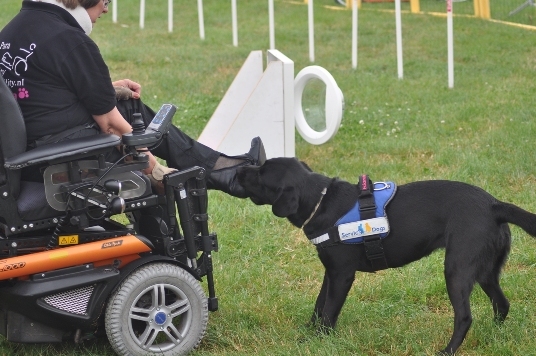 Always very nice to hear from the visitors how good it's to see how a dog can work as servicedogs and later so enthousiast is running an agility-course. Many times we hear: " it's really the same dog?..... now running so fast agility ...before he gives you help by put out your coat...incredibly!! And I can give this answer with a lot of pleasure: the dogs do it both with a lot of fun "!! Meet a lot of people from years before, but also new one......great to see how people can train/ work with animals and give such fantastic demonstrations!! Thursday 25 April we went to Hal Flanders Expo In Gent (Belgium). Otto Bock (supplier of my electric wheelchair www.ottobock.nl ) was standing on this big Market for people with a disability. 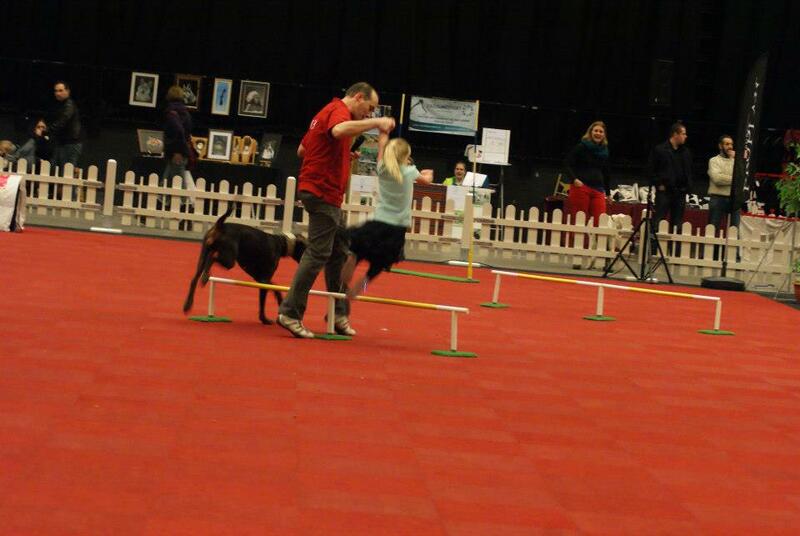 We had given demonstraties and also some workshops agility. 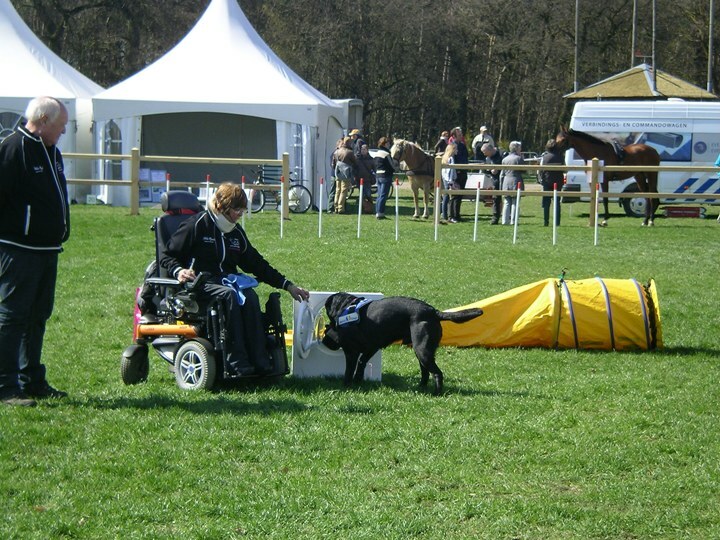 Sunday 21 April we drove to Horst aan de Maas to a big International Horse-Event to give demonstrations servicedogs and para-agility. 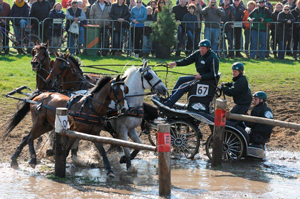 Great to see the teams, from all over the World, with their horses working on this Competition. Doesn't matter you are working with dogs or horses.....both wonderfull to do and look at!! 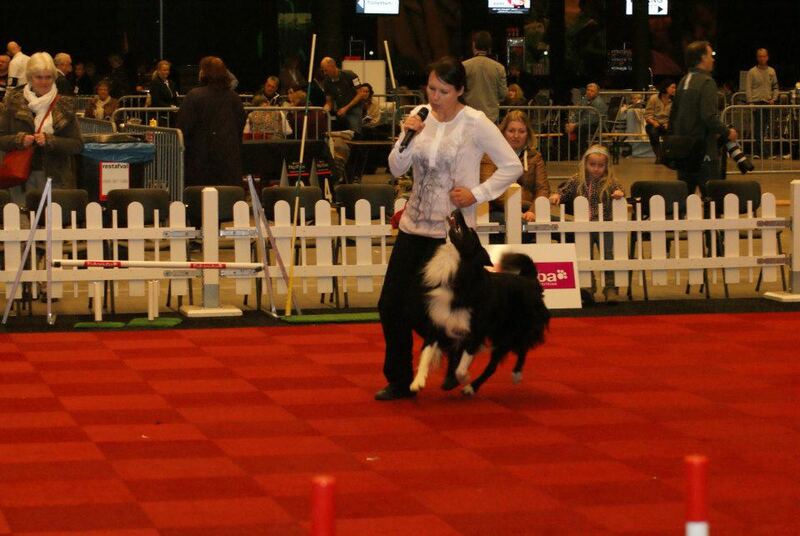 Meanwhile the 19th edition of this International dogshow C|AC & CACIB in the Hal "Plantarium" in Hazerswoude. 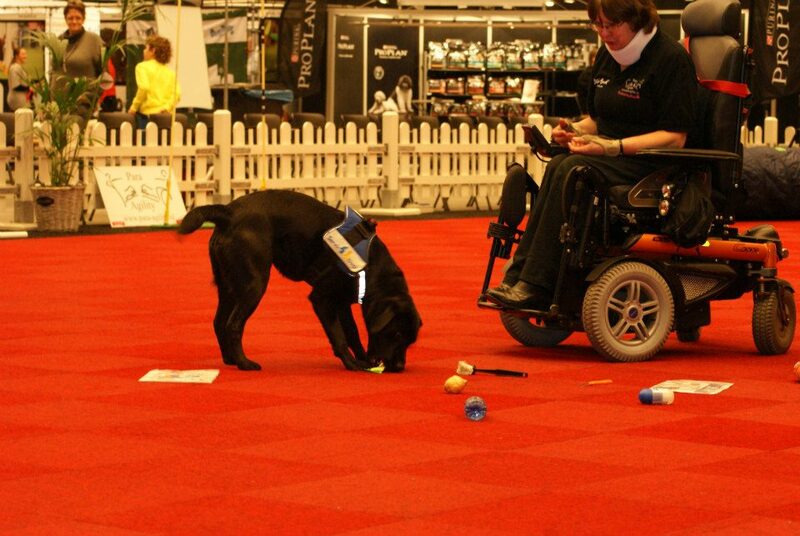 Joep and Joy had given demonstrations servicedogs and para-agility. On fridaymorning, our car totall full, we start our trip to the Martiniplaza-hal in Groningen. 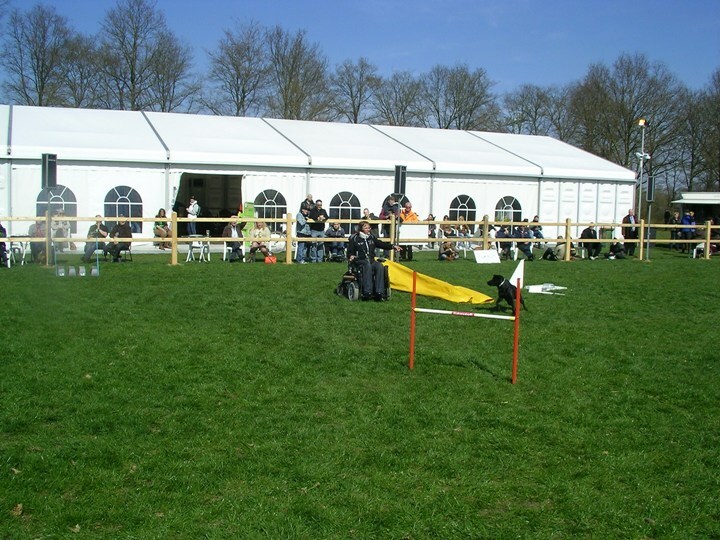 When we arrived, we brought all agility-obstacles and things we need for demonstration servicedogs into the Hal, have some nice talks with a lot of people who are bilding their stands and went to the Fletcher Hotel "De Zeegse Duinen in Zeegse" and had a nice walk with our dogs. Joy enthousiast door de paaltjes! AHOV from Borgsweer ( www.ahov.nl ) . Karin very enthousiast with her dog! 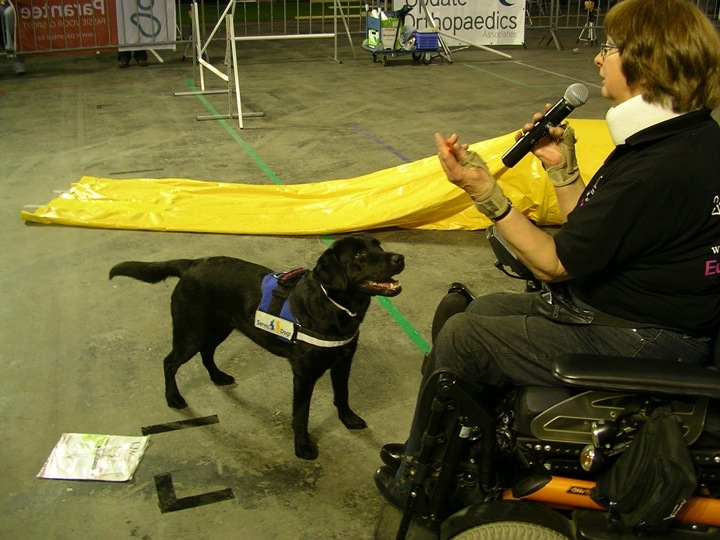 Even we have given short workshops so the visitors get the possibility, by the help from one of us, to try the agility or combi-sport. 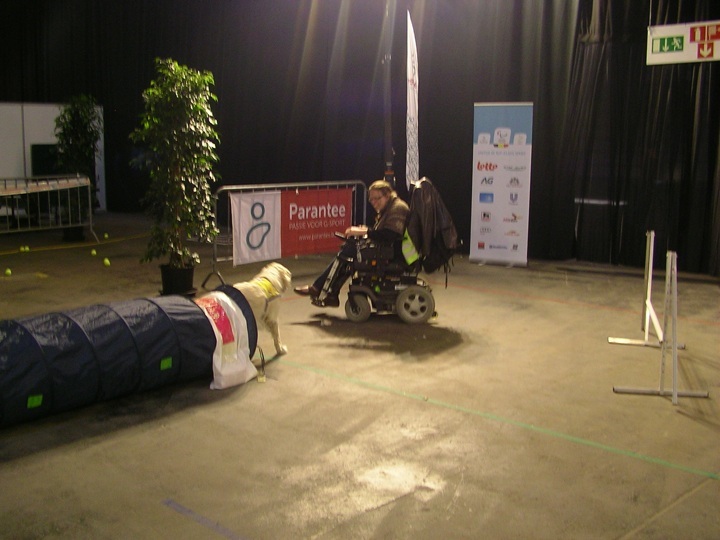 Also present, for given demonstrations obedience, Karin Stegmeijer which had showed how you can work with your dog very close. A very pleasant weekend with a lot of dogsports. Mario with a young handler teaching combi-sport!